South Korean Prime Minister Lee Nak-yon said Tuesday that his government will do its utmost to make up for the slow progress in its relations with Tunisia. Lee made the remarks in a meeting with Korean nationals here after becoming the first South Korean prime minister to visit Tunisia. He arrived in Tunis, the capital of the northern African nation, earlier in the day from Algeria, as part of his three-nation African trip that will also take him to Morocco. 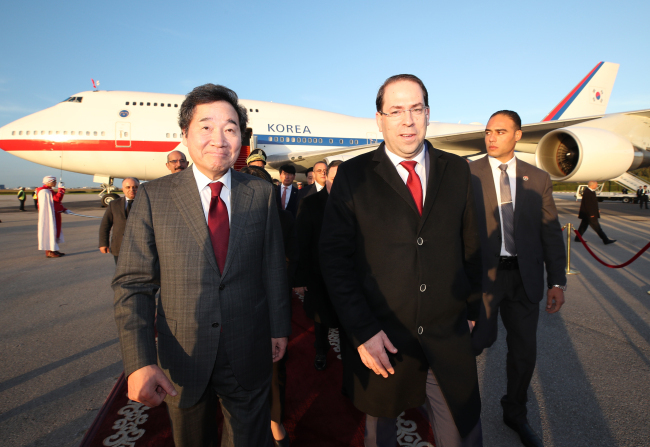 Lee was greeted by Tunisian Prime Minister Youssef Chahed at the Tunis airport before attending the meeting with South Korean residents at a downtown hotel. Tunisia, known as the place where the 2011 Arab Spring, a series of pro-democracy uprisings in the region, started, is reportedly pushing to strengthen economic cooperation with South Korea. "Tunisia and South Korea established diplomatic ties 49 years ago. I'm the first Korean prime minister to be here. It may be late, but I'll work harder to make up for the slow progress in the development of bilateral relations," Lee said. Lee noted that South Korea's previous administrations had vowed to diversify diplomacy but the pledges were not properly implemented. He also said the Moon Jae-in government will continue to take the path towards inter-Korean peace despite some difficulties at home.